We are all a far more environmentally conscious people these days, where the threat of global warming is very, very real. Of course, electric cars have yet to make it to the mainstream consciousness across the world, for obvious infrastructure reasons, and there is also the issue of costs involved, but it sure as heck is encouraging to see how the world is slowly but surely lowering their dependency on fossil fuels where vehicles are concerned, and instead, looking towards greener solutions, including hybrid ones. 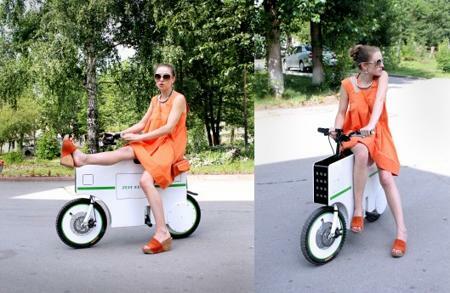 The Zeit Eco is definitely not the first kind of electric scooter that has been released, but according to the creators of the Zeit Eco, this particular compact last mile transport vehicle is able to stand out from the rest of the crowd, which we will deal with right after the jump. For starters, the Zeit Eco comes with a hub motor that offers an electronically limited top speed of 15 mph (24 km/h), which will not make your adrenaline pump as though you were about to step on the accelerator while being involved in a drag race, and its standard battery pack ought to be decent enough to offer a range of anywhere from 16 to 25 miles (25 – 40 km) per full charge, depending on your weight, riding style and road conditions. Another feature of the Zeit Eco would be a built-in “glove compartment” that is large enough to ensure that a tablet remains safe from harm whenever you travel, while the included handlebar charging port will make sure that your mobile devices get some juice en route to your destination. Not only that, there is also an onboard audio system that ought to offer the relevant entertainment on the go, although I would strongly recommend against wearing a pair of headphones as you zip around in this puppy, since hearing what is going on around you would make a whole lot more sense. This Kickcstarter project has started to receive pledges, which will begin from $1,700 a pop, and delivery is estimated to happen in November if all goes well. The funding window will remain open until May 17.